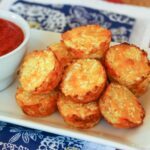 Cheesy, crispy, so amazingly good that they'll easily replace those other tots as your family's favorite side dish. Preheat your oven to 400°F. Spray a mini muffin tin with oil or coking spray. Place the shredded cauliflower in a kitchen towel and squeeze out the excess moisture. Combine all of the ingredients in a large bowl, and mix together thoroughly. I like to use a fork. Using a spoon or scoop, divide the mixture between the muffin cups and press down firmly into the cups. Bake at 400°F for 20-25 minutes, or until golden brown. Allow to cool slightly before running a knife around the edge to pop the tots out of the muffin tin. You can use the shredding attachment for a food processor or a hand grater.